After separating back in April 2017, it looks like Carmelo Anthony and LaLa are back together again. 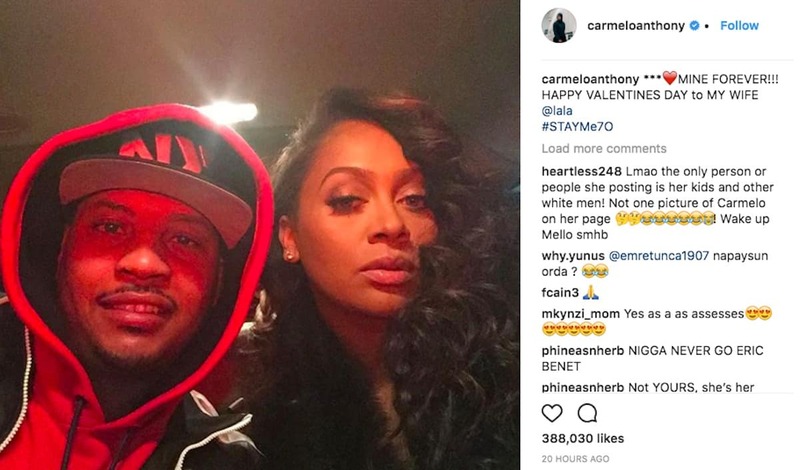 Carmelo posted the above photo in honor of his wife on Valentine’s Day. Sadly, LaLa didn’t return the favor by dedicating a post to him on social media, but at least these two appear to be working things out behind closed doors, right? Previous articleCardi B Is Pregnant?! Carmelo Probably Be Looking In The Mirror Singing…….”I Remember The Days U Used 2 Love Me” @ LaLa…… When He Is Getting Ready In The Morning. These are the stories I like to see. Shoutout to the god Melo and LaLa….. They are a dope couple in my opinion. They both waiting on the paternity test results. Most wives return once the test shows it aint his child. Shes a HOE. Hes a HOE too. Two hoes are better than one? Dont she got a thing for women though? ?